Our daughter Fran has put these FAQs together based on the many questions we have been asked at food festivals and farmers markets over the years. 1. What is the difference between a black, bronze and white turkey? This is the question we get asked the most, the names refer to the feather colours, however underneath the feathers it’s all a matter of taste. Bronze and Black turkeys have been bred from more traditional varieties and tend to have a slightly more gamey flavour, but because all our turkeys are fed on home grown corn and have a good life they all taste great. 2. What size bird do I need? 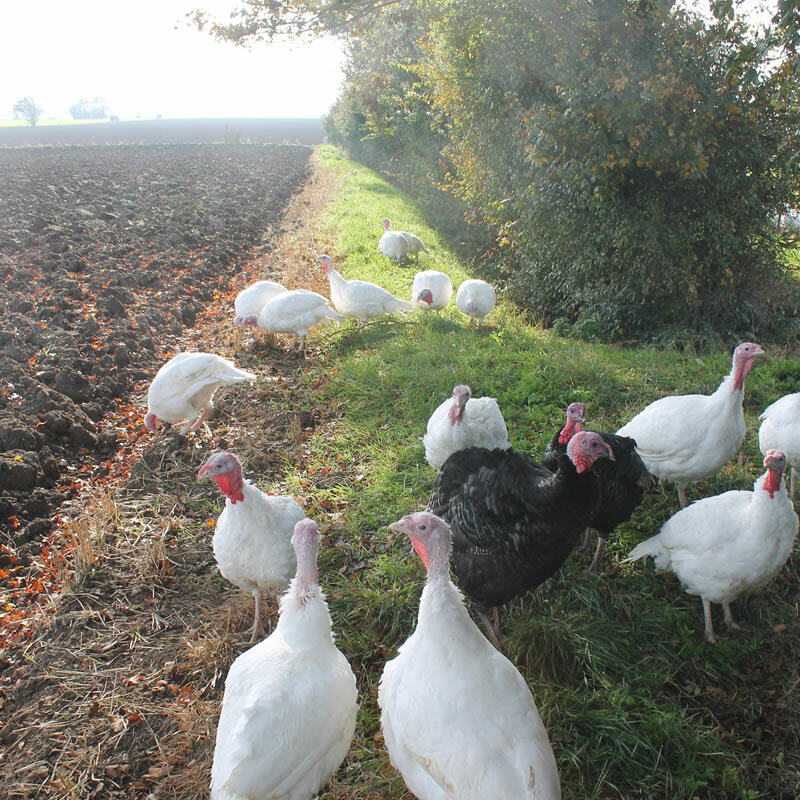 We have provided a size guide on our turkey and guinea fowl product pages. 3. Are our Turkeys organic? Our turkeys are free range and reared very naturally in the same way as my Grandfather did back in the 1930s, without the addition of feed additives and chemicals. As all of our birds are fed on grain grown right here on the farm and we mix our own food, we know exactly what goes in to them. So although we don’t have an organic certificate our turkeys are basically organic, without the high price tag! Our Guinea Fowl are reared to the same high production values. 4. What do we feed our birds? Most poultry farmers buy their feed from a large commercial mill, but we still believe that the grains we grow on the farm are best for our birds. So we grow wheat, barley, oats, beans and peas on our farm and then mill them ourselves to ensure only the best quality feed goes in to your Christmas dinner! 5. What does free range actually mean? Free range means our birds have grassy paddocks to run around in where they have enough space to really spread their wings and feel the wind in their feathers. At night they sleep in a warm dry shed to protect them from any hungry foxes on the prowl. Don’t worry – so do we! We deliver to lots of farm shops and butchers around Suffolk and they are all listed on our where to buy page. Just find your local stockist and contact them directly to place an order. 7. Where are you and how do I get there? We are located in north Suffolk, all our details are on the contact us page, including a map to help you find us. While for some the annual turkey collection is a ritual, for others it is one job too many – so if Cratfield is just too far check out our other outlets in Suffolk or order online for direct delivery to your door. 8. Can I buy a turkey or guinea fowl at any time of the year? We always have fresh guinea fowl available. Ring or email us to check availability or place an order. We also think turkey shouldn’t be just for Christmas, so if you’re looking for a bird at any another time we usually have frozen birds available, which taste as good as our fresh ones but for a fraction of the price. 9. How do I cook my bird? That’s a good question and one we get asked time and again which is why we have a dedicated recipes page. Which as well as giving you cooking times and tips for the perfect roast, also has other ideas and recipes for both guinea fowl and turkey, all tried and tested in the Whitehouse farm kitchen and given the Mobbs family seal of approval! 10. What do the Mobbs Family eat on Christmas Day? Free range is not a new idea to us – it’s the way we’ve always done things.